In this thread, I would request everyone to post firing results of different handguns that we own or use. However, unless there are standard parameters to quantify the results, there is no use of such an exercise. I would therefore suggest a standard method which I have been following myself to check the accuracy of various handguns. This, by no means is a comprehensive method but a quick and economical one.. Any suggestions to improve this method (while still keeping it economical) would be most welcome. MOST IMPORTANT THING TO REMEMBER IS THAT THIS IS THE TEST OF THE GUN AND NOT OF THE FIRER. 1. In order to minimise firer's error, handgun should preferably be fired from a bench. If a proper firing bench is not available, firer may rest his elbows on a table while himself sitting on a chair. 2. 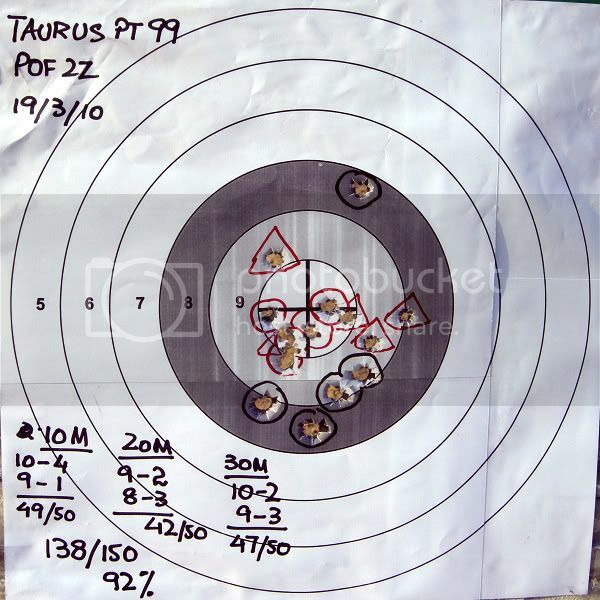 A standard target with 1 inch radius bull (10 points) 2 inch radius 9 ring, 3 inch radius 8 ring, 4 inch radius 7 ring and so on, be used for firing. 3. One round of test fire should consist of 15 bullets, 5 fired from 10 M, another 5 from 20 M and another five from 30 M. The procedure should preferably be repeated twice, ie, total of 30 bullets. Two warmer rounds should be fired from the gun before starting test fire. This will make a total of 32 bullets for one handgun. 4. Ammo should not be changed during the test. Moreover, magazine should be filled to max capacity, in order to check the performance of magazine and chances of failure to feed. 5. Aiming point should be the center of the bull and must not be changed throughout the test even if a firer can clearly note bias of bullets on a particular side. ie, no adjustments should be done throughout the test. If guns has adjustable sights, they should be zeroed before the test but during the test, sights should not be adjusted. 6. Photos be taken after each test. 8. MOST IMPORTANT THING TO REMEMBER IS THAT THIS IS THE TEST OF THE GUN AND NOT OF THE FIRER. So please don't try to improve the result by making adjustmet. Just fire the gun as it is, adhering to standard parameters mentioned above. I will start the thread by posting the test fire results of a few handguns. I am sure others would also add their pics following the standard procedure. After some time, we will have a good number of pics concerning different guns and a new user will be able to compare the results and at least have some objective input about one of the very important aspects of any handgun. 1. This by no means is a final result of some kind of ACCURACY COMPETITION held between these guns. Neither these tests are the perfect / most scientific tests for judging the accuracy nor this should be taken as the final performance of a particular brand of handgun. 3. Few handguns have performed really bad. This again does not mean that all specimens of this brand would perform the same way. May be the one I tested was a lemon or its sights were way out. But one thing is for sure; there is some serious problem somewhere. So please keep that handgun on your watch list and check it thoroughly before making a decision to buy it. 4. Please do also understand my limitations as a human being. I will never be able to give a standard performance every time because it is humanly not possible; only machines can do it. Accordingly, the results may slightly vary for different handguns but not too much. 5. This, by no means is a marketing campaign for a few handguns and a dumping campaign for the others. You may consult this as a reference but finally make your own decision while you are buying a handgun, keeping in mind your requirements and pocket. 6. Therefore, these tests are not a most scientifically conducted final verdict on a particular handgun, however, they do provide a tangible basis for judging one of the most important characteristic of any handgun; its accuracy.